I’d like to say it was planned, but that would imply too much credit on my part. It’s true that I knew 2013 would mark fifty years after the publication of Beeching’s now infamous report on “reshaping” Britain’s railways. In fact when I planned to walk the Downs Link, I didn’t even realise it went down old railway lines. Only whilst doing my research on the trip did I find out the “happy” coincidence. I’d just been attracted by the fact that it linked the North Downs Way and South Downs Ways, two trails I’d walked already. I had fond memories, especially of the South Downs, and I was intrigued to see how the landscape would change as I travelled between the two. Well it was as good a reason as any to head to St Matha’s Hill, the start of the trail, on a rather soggy Saturday in April. Quite why Downs Link starts at the top of St Martha’s Hill isn’t particularly clear. Almost all the trail follows the former trackbed of a railway closed in the 1960s as part of the Beeching cuts so it’s pretty flat. But the first four miles instead meander around lanes and tracks, starting from St Martha’s Hill. 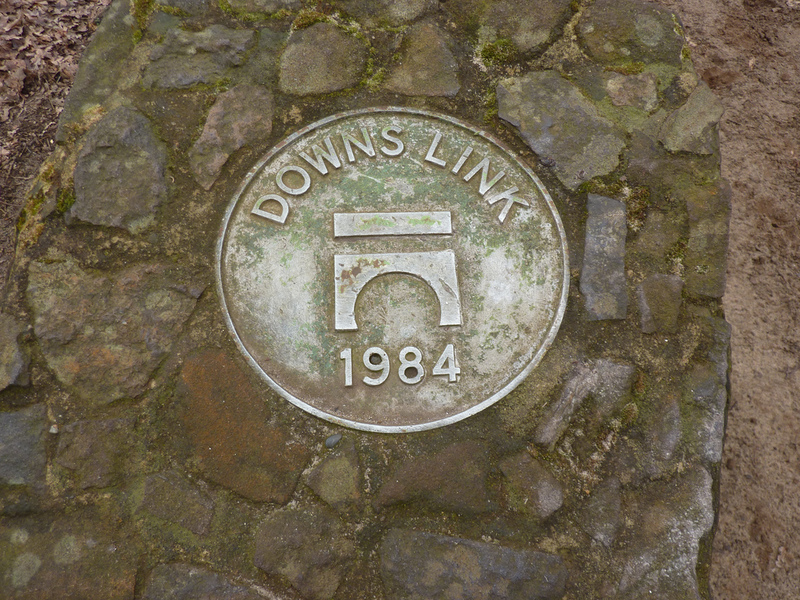 About the only obvious reason is that it allows the Downs Link to connect with the North Downs Way which also traverses St Martha’s Hill. That and the fact that St Martha’s Hill is a bit of a local landmark, thanks to its isolated church, parts of which date from the 12th century. 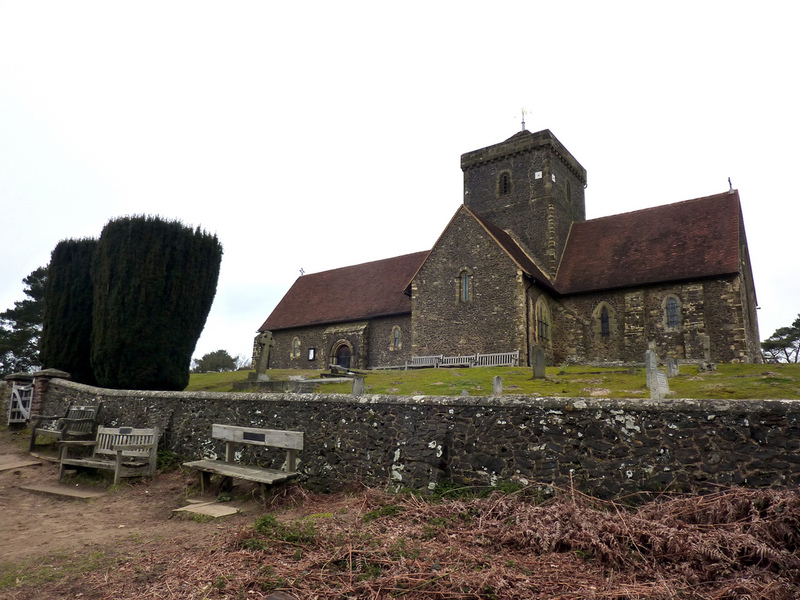 Once the church had been an important staging post on a busy route, but when the era of the motorcar arrived, the roads remained at the foot of the hill. Now the church sits alone, accessible only by foot. Not that Downs Link actually starts at the church. Instead it starts a short distance away at a junction of sandy paths; a small stone cairn marking the official start, before heading straight back down hill again. The notion of starting a walking trail at the top of a hill is – on paper – an appealing one view. For starters you can give the people walking it a fantastic view on which to start their journey. Which is why I started walking Downs Link, panting for breath, cursing the fact that I was rather out of shape on the hill climbing front. Oh and the fact that no sooner had I got up there, than I had to go right back down again. I’d got to the top of St Martha’s Hill having set off from Chilworth station in the valley below,, and now I was heading back to it. Chilworth hadn’t changed much in the hour since I’d last been there but almost as soon as I’d arrived, I’d left again. Here was the first railway link as the path went over the distinctly open North Downs railway line which connects Reading and Redhill. I peered over the sides of the railway bridge – built up high to stop people from dropping things on the tracks – but there were no trains. Not that I was particularly surprised. The line only gets two passenger trains an hour in each direction. From there, the path led to sparse woodland on Rosemary Hill, before heading to the more dense trees of Wonersh Common. Recent rain had paid its toll on the footpaths as I slipped around on a path that had become a veritable quagmire at parts. Only a narrow ledge of grass on the side of the path provided any safety at all, and I gently manoeuvred as best I could in order to prevent myself from falling in it head first. 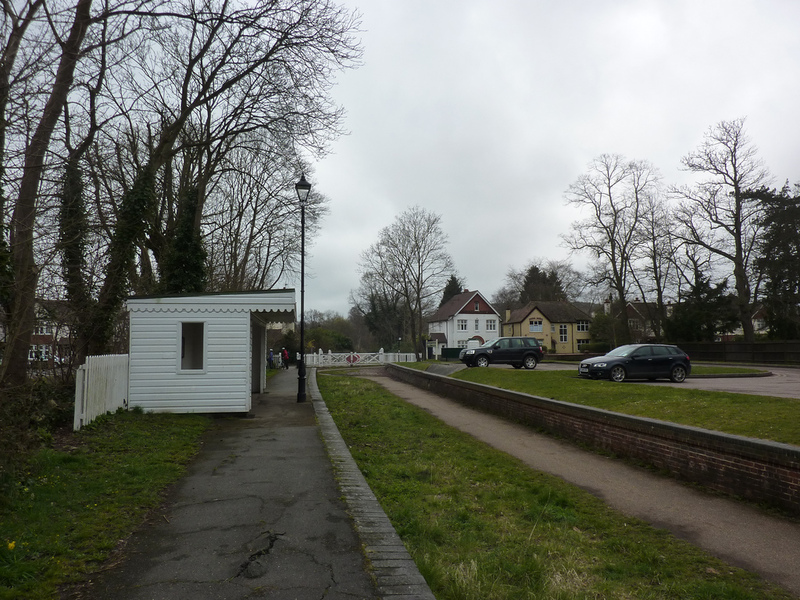 Thankfully the path led to a distinctly easier section of tarmac, through the village of Stonebridge before finally the Downs Link arrived at the main event – the trackbed of the Cranleigh railway line. A twin arch bridge spanned the old tracked, with the first arch originally going over the Wey and Arun canal. The 23 mile canal which connected with the Wey and Arun rivers was never a commercial success and was officially abandoned in 1871 just 55 years after it opened. The canal bed lasted substantially longer, only being filled in in 1972. Despite that, an active band of volunteers have been hard at work, attempting to re-open the canal so it can be navigated once more. They certainly had their work cut out for them. Paths along old railway lines tend to share similar features. Relatively straight, relatively flat. The signals and railway paraphernalia may have gone, and the undergrowth may be creeping in from the sides now that no railway workers were there to crop it back, but the clues were always there. Naturally Downs Link followed the same theme, but every now and then there’s a a clue to the former life. One such item was outside the village of Bramley; a children’s playground featured a replica of a train, ideal for the younger generation to run around and clamber over excitedly. And then, a little further on, was something that left the walker in no doubt of the local history. “There’s not a day I pass through here that I don’t wish the railway was still open,” said an elderly woman as she passed me by on the former platform of Bramley and Wonersh station. “It would have taken a lot of this traffic off the road, for a start,” she carried on, pointing to the car-filled road nearby, where the local traffic was barely moving. “Indeed. But in the 1960s the attitude was that the car would solve all our problems!” I replied with perhaps a hint of regret that can come from someone who has never owned a car, and who relies on public transport to get around. There may even have been an element of smug self-satisfaction involved. And with that she bade me farewell, leaving me on the platform wondering about what once was. It’s hard sometimes to walk down a long closed railway line and not thing about the steam trains and carriages that once came this way. The reality is that Beeching closed some railway lines that he really shouldn’t. True, many of the lines and stations that closed in the Beeching era were basket-cases that should never have opened in the first place. Others had been living on borrowed time for years after passenger and freight trade had either failed to show up, or had simply disappeared. However there are others where closure would prove to be a big mistake. The Cranleigh Line was one of those. The resulting car growth over the decades was paying its toll on the area, and a report in 1994 for Surrey County Council concluded that partly re-opening the line down from Guildford, through Bramley and Wonersh and on to the town of Cranleigh, would take 500 car users off the road each day. British Rail looked in to a few years later, and the Railway Development Society did the same. By 2009 the Association of Train Operating Companies even got in the act, suggesting the line could be re-opened in five to ten years. The residents, stuck in their traffic jams, are still waiting. Bramley and Wonersh may have lost its service, but parts of the station still remained, lovingly restored by local groups. Whilst the station buildings had long gone, a former waiting shelter sat on one of the platforms next to a mock-up of a signal, permanently locked in the stop position. At the end of the platforms, where the line one crossed the road, the level crossing gates lay across the former track bed; waiting to be opened once more for a train that would never come. Bramley seemed to be a long, thin village. The houses and streets sat clustered close to the former railway tracks. Or perhaps, more accurately, along the A281 road which ran closely by. Whilst the tree lined path of the old train line kept sight of the road to a minimum, the noise of cars rushing on their way meant you always knew it was there. Far more peaceful were the remnants of the old canal along with Cranleigh Waters, a narrow, shallow looking river. Together all four meandered south for a couple of miles, as if scared to leave each other. 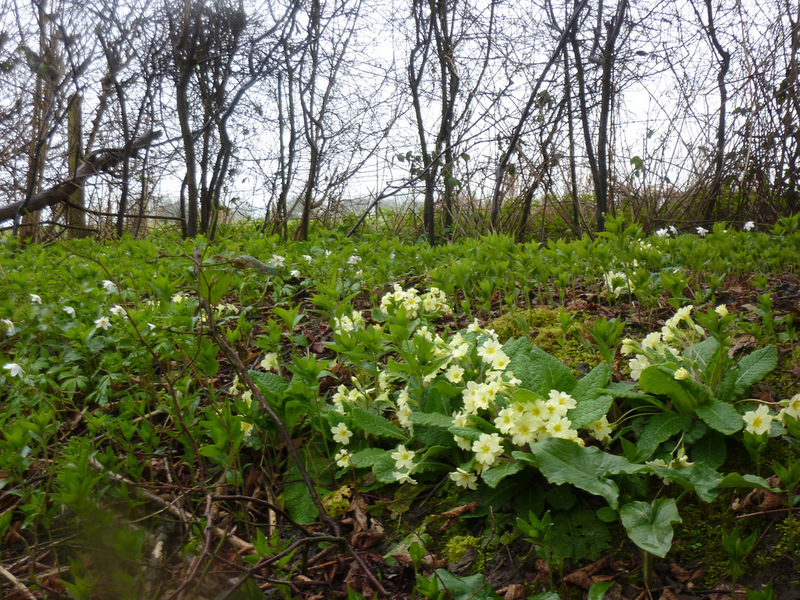 There was an abundance of primroses lining the banks of the path in abundance and a short way out of the village I settled on a log and enjoyed my lunch. I’d been keeping my eye open for a bench – there’d been plenty earlier in the day, but no sooner had I wanted to sit on one and they’d all disappeared. Naturally, I found one within minutes of finishing off my sandwich and setting off one more. Things began to change again as housing re-appeared and the Downs Link made its way into the heart of Cranleigh. Unlike its neighbour, Cranleigh had little to commemorate the railway. The former station had been demolished, replaced by a shopping and housing development, with a large car park next to it. The only commemoration seemed to come a short way on at a sports ground. A large, modern white sign – the kind you expect on a road as you ever a town – made sure walkers knew there were in Cranleigh. But if anyone was expecting some greater commemoration, they would be out of luck. 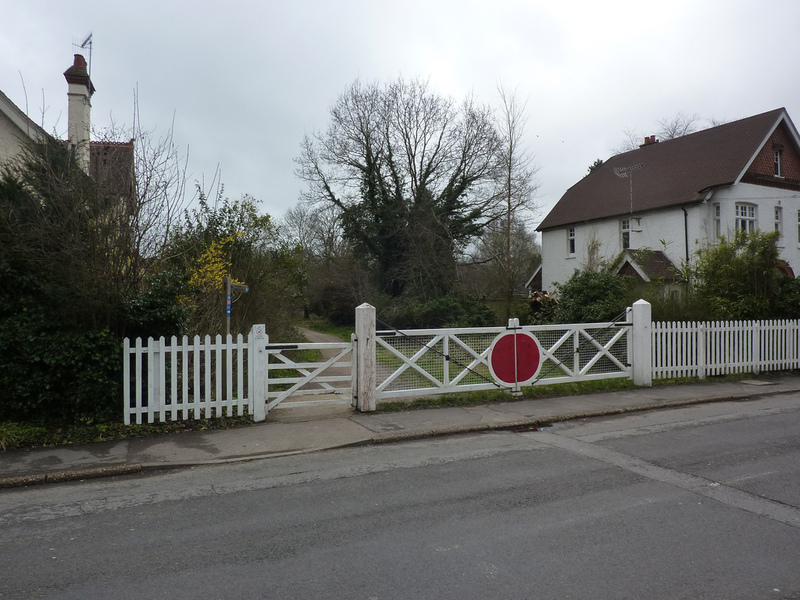 As far as Cranleigh was concerned, the railway was gone and would never be back. I knew I’d made a mistake not putting my waterproof trousers on. There’d been light rain for at least an hour, and it was slowly but surely getting worse. But by the time I’d realised, my walking trousers were completely soaked; the wind choosing to whip the sodden material against my legs. Whether it was the weather or not, I couldn’t tell, but the Downs Link was now deserted. All morning I’d been overtaken by fluorescent lycra-clad cylists, joggers and even the odd walker. Now I seemed to have the Downs Link to myself as the path headed straight along. Surrounded mostly by trees, the old railway line felt rather gloom in the rain, with only the odd bridge breaking it all up. My boots squelched and sploshed in the puddles, whilst every now and then the path descended into a muddy morass. I peered through my rain splattered glasses, trying to work out if the line had been single or double tracked, but there were so many bramble bushes overgrowing everywhere that it was almost impossible to tell. 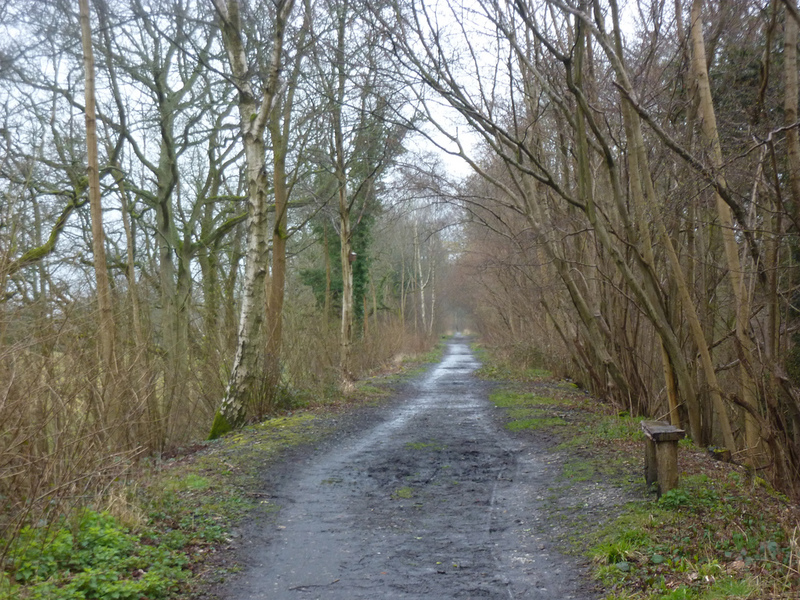 Left to its own devices, an old railway line can soon be reclaimed by nature. Whilst walking the Ridgeway a few years earlier I’d walked on a bridge over an old railway cutting which was now so densely overgrown that it was impossible to imagine it had ever been any different. It wasn’t hard to imagine that the Downs Link needed a fair amount of pruning on an annual basis to get the brambles away. I walked on, passed a mysterious building with a “CLOSED” sign above the front door. This proved to be the former Thurlow Arms pub in Baynards, now converted into a private residence; the pub’s Les Routiers sign still affixed to the front door. Sat a short distance from the trail, with a slight platform effect in front of it, it almost looked like the Thurlow Arms had been a station, but the former Baynard’s station stood opposite. Again, now a private house, Baynard’s is the only station on the route to have remained pretty much intact. The old station building had been converted to a house, but the station canopies and platforms remained, maintained lovingly by its owners. Not that there was much to see from the Downs Link, which had been routed away from the station on a side path, but a gap in the fence providing a fleeting glimpse of what once was, perhaps in better condition than it ever was under British Rail; vintage enamal advertisements placed on the platforms under immaculate woodwork. On the original railway plans, Baynards wasn’t even going to get a station. That the hamlet got anything can be credited to one Lord Thurlow. The railway went through his land and the opening of a station to serve the estate was made a condition of sale, despite the fact that no one actually lived there. That didn’t stop the station also serving as a post office though, but even if the Cranleigh line had remained open, it’s hard to imagine the station would have survived with its splattering of houses and a closed pub. For some reason, footpaths down old railway trackbed don’t often go through the old tunnels. Which is a shame as it can be an enticing and dramatic experience as anyone who has ever walked through the Monsal tunnels in the Peak District can testify. There’s something about the moody dramatic lighting; the water dripping down the brick walls. But putting footpaths through them means maintaining the infrastructure to a higher standard, plus lighting to install, health and safety hazards to assess. And in Baynards’ case, there would be rubbish to clear as well. Ever after seeking innovative solutions, part of the closed tunnel had been used by the local council as a rubbish tip. Well why not? It was underground. No one would know. Why not just fill it with local waste? These days the tunnel is left in peace, and the entrances all blocked off. The northern entrance at Baynards has been mostly buried under soil and undergrowth, meaning the Downs Link heads off instead along a selection of increasingly muddy paths in a wood above the tunnel, crossing the border into West Sussex in the process. The southern end of the tunnel was more noticeable; a bricked up tunnel mouth with a solitary door set in the middle to keep people away from the colony of bats who had taken up residence after the railway tracks were lifted. 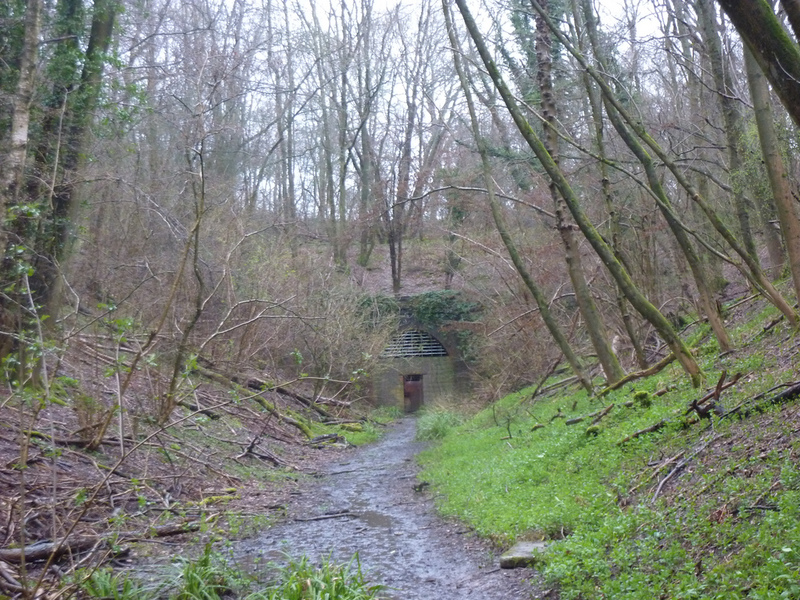 As the Downs Link rejoined the old line, I glanced at the tunnel entrance through the rain, pondering a detour before decided that really, heading off down a muddy track just to see a padlocked wooden door, probably wasn’t worth it. The weather had, at least, got a little better, but water was streaming down the sides of the railway cutting. A network of concrete culverts did, at least, keep the worst of the water off the footpath but such had been the downpour, that they were struggling to cope with the demand. As I approached the village of Rudgwick fellow walkers also began to appear again; usually togged up to the nines in waterproofs and wellies whilst a large dog ran around, enthusiastically jumping in puddles. My original plan had been to walk on another six miles to Christ’s Hospital – a total of nineteen miles or so – but even by the time I’d got to Cranleigh it was obvious I’d never make it. The distance shouldn’t have been a problem but the muddy paths had made going slower than I’d expected, and the damp weather had left me with stiff and aching legs. The small village of Rudgwick would be the last place where I knew I’d be able to get a bus; an hourly service connecting to either Guildford or Horsham. If I passed on through, I’d be committing myself for the whole thing. If I stopped, I’d end up having to spend two more days walking the trail. With an eye on the clock, I sighed and prepared to leave the trail just before the remnants of Rudgwick station and went in hunt of the village bus stop, and somewhere to shelter until the bus came. I found only one place; a covered walkway outside of the Co-operative supermarket from which it was impossible to see if the bus was coming or not. If the bus was early, the first I’d know would be when it went sailing straight past me. With little choice, I heaved my tired legs across the road and stood at the bus stop in the rain. Not surprisingly the bus appeared right on time. Next time: we return to Rudgwick for the start of a two day extravaganza. And less rain. There is now a cafe a few yards from the walk at Rudgwick. The Milk Churn specialises in Cheese on Toast made from the Cheese they produce at the same location. Well worth a stop there…..
First Published: 12 February 2014. Last Updated: 4 January 2019.